For this first project, I am asking you to sit down with family or friends and #mapyourhood – draw your neighbourhood on a sheet of paper! Just get a few pens or pencils and get creative. Where do you think you neighbourhood starts and ends? How do you perceive your way to the next shop, the next bus stop or work? This doesn’t have to be an accurate map of the neighbourhood and you don’t need to be a good artist! On the contrary, it’s about different perceptions and different ways of expressing them with the means you have. Try to draw the upsides and downsides or strengths and weaknesses of your neighbourhood and opportunities as well, if you like. In urban planning, this is a popular participatory method to identify potentials in a neighbourhood. With a group of neighbours participating, you quickly get a good idea of what works and what doesn’t (and for whom). It also invites residents to engage with their neighbourhood in a different way and is sure to be eye-opening. Get together with at least one more person who knows your neighbourhood well or lives there and send me your drawings to be featured in a gallery below (laura@parcitypatory.org)! Alternatively, upload your pictures on Instagram using #mapyourhood. Of course, publication will be anonymous. 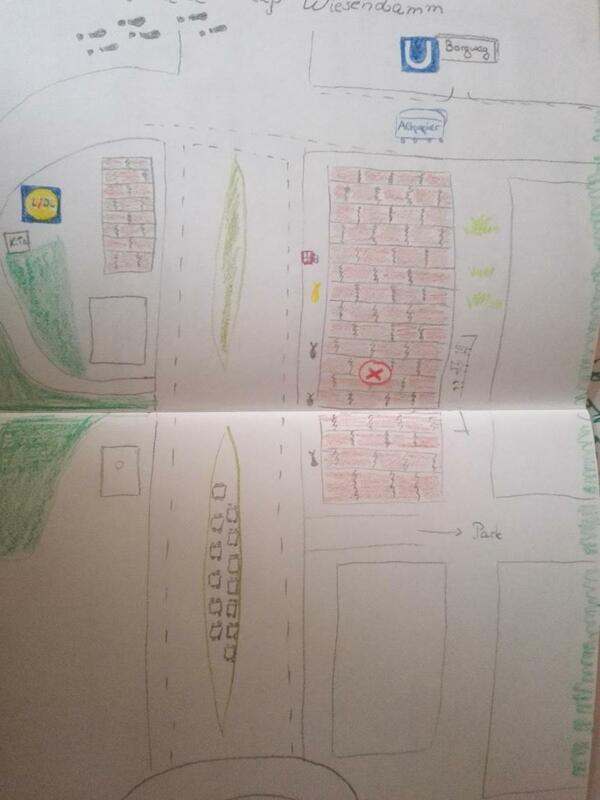 A photo with view of the street would be a helpful comparison for viewers and some notes on upsides and downsides will help me to better describe your drawings. Here are some completed drawings. Thank you to everyone who participated and allowed me to use their pictures! This is a safe and clean street near a big park in Hamburg. 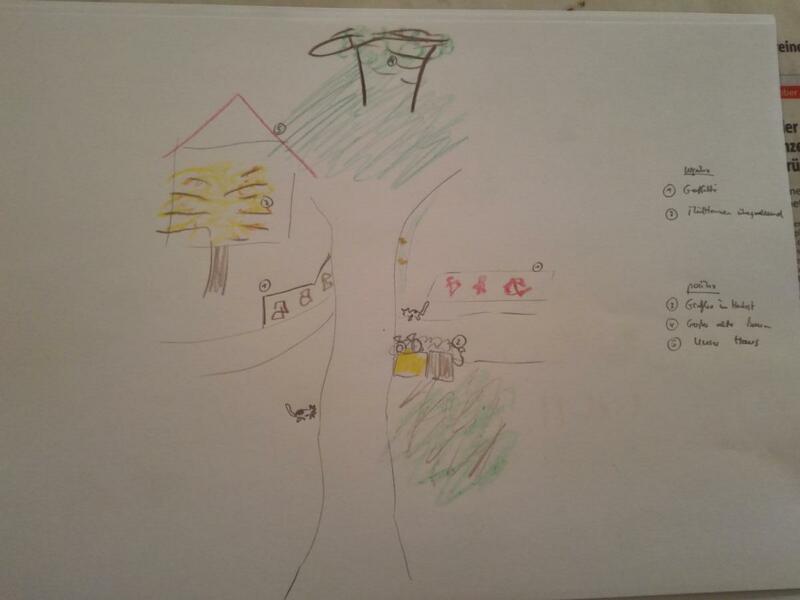 As you can see, participants drew the green areas surrounding and defining the neighbourhood. Three of them also drew little gifts on the wall in front of the houses, since there is a practice to put things that are not needed any more there for the neighbours or any passers-by. Participants perceive public transportation links, shops, the nearest post office, the brick walls of the houses and cars (not everyone does), and one of them remembers to draw in some pedestrians too. A discussion round revealed that there are not many weaknesses apart from the fact that there is a lot of anonymity among neighbours and that it sometimes smells of waste because the bins are placed in front of the houses next to the sidewalks. Jena is a medium-sized town in Eastern Germany. Residents of this particular street all noted the green surroundings, but chose very different ways and perspectives to display the street. While participant no. 4 drew a 3-D rendering of the view, participant no. 3 decided to draw a night view. The fact that cars and pedestrians are missing points to the fact that this is a very quiet road, which was described as mostly positive but sometimes almost a bit scary. Three of the participants drew the same tree in front of a house, which seems to be an identifying symbol of the neighbourhood. Animals (dogs without a leash and a loud rooster on picture 2, cats and animal faeces on picture 1) feature as well. The night view picture (no. 3) shows that there is a lack of street lighting at night. Participant no. 1 also noted some unwanted graffiti. Our discussion revealed that a neighbourhood festival to maybe turn the graffiti into street art and to further get to know neighbours could be a summer activity. Comitán is a small town in the very South of Mexico. It is peaceful, quiet and idyllic. 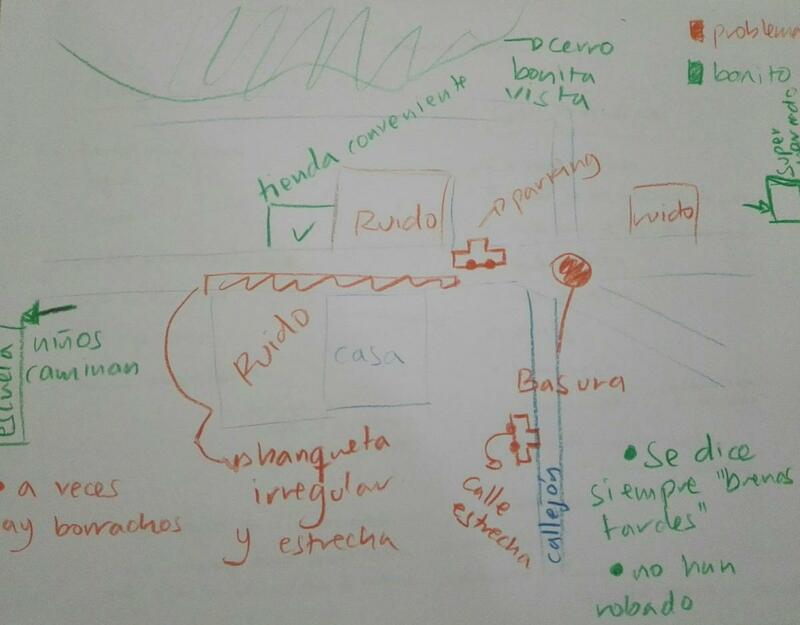 I had the privilege of staying with a family there for a few weeks and asked them to map their neighbourhood. Again, the family members noted a few similar things, such as annoying noise from the car workshop next door and some trash in the streets as well as irregular side walks, which make it difficult for pedestrians to navigate the crossing. Positive aspects include the beautiful view, some very friendly neighbours, general safety and convenience stores nearby. Interestingly, the person who drew map number 2 included not only the neighbours (some of them staring too much), but also a lot of different animals and plants. This is a beautiful lively view of the neighbourhood, isn’t it? In the discussion following the mapping exercise, the family remembered that there used to be a street festival that connected neighbours, but there were some faults in organisation and it was not attended by many people. At the same time, they noticed the lack of a public space to socialise. Send me some drawings and key words about your neighbourhood or use the hashtag #mapyourhood on Instagram to get featured in this gallery!